It’s time to meet Steve and Flippo at BookPeople tonight! It’s time to read a memoir! It’s time for the Stand Up Sit Down book club tonight! And now let’s read a memoir! Why don’t you read a memoir? Stand Up Sit Down Book Club Show! Unfortunately, the above rousing tribute was rejected as the theme song for the Stand Up Sit Down book club due to the fact that the lyrics are inaccurate and misleading, the proposed theremin solos between each verse were too derivative of the Octopus Project, and the strikingly similar theme song to The Muppet Show predates this draft by thirty-seven years. Come join the Stand Up Sit Down book club at BookPeople on Monday June 24th at 7:00 p.m. as we discuss Tina Fey’s pitch-perfect Bossypants, and maybe we can find the time to bang out a few new song ideas while we’re at it. 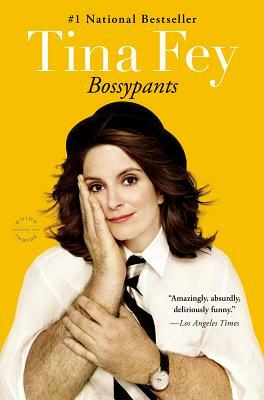 Bossypants by Tina Fey has been hailed (by me, just now) as “the gold standard in comedy/gender politics/boating mishap memoirs in recent memory”. It is truly a riotously funny and whip-smart narrative of the creative process of a quiet genius. Interspersed with hilarious and sarcastic anecdotes and comedy bit-lets, Bossypants takes the reader through Tina Fey’s flamboyantly formative childhood theatre camp coming-of-age to her haltingly successful cultish devotion to improvisational comedy, leading finally to her reluctant fame as a writer and political satirist on Saturday Night Live and star of the oddball, absurdist sitcom 30 Rock. If you can wrap your mind-grapes around Tina Fey’s singular imagination, drop by BookPeople’s hectic sound stage of a cafe on Monday June 24th at 7:00 p.m. to chat about the book, your personal views on comedy, or just to talk about that time on 30 Rock that Tracy Jordan hallucinates a malevolent, blue dude that chases him around NBC studios. The Stand Up Sit Down book club meets on the last Monday of every month at 7:00 p.m. in the green room of BookPeople’s cafe to discuss the memoirs of our favorite comedians and speculate about the creative process. Join us this Monday to talk about Bossypants by Tina Fey. Just tell us that Dr. Spaceman sent you. I wish I could be there, but since I live in California…it’s not likely. Heck, I just wish I lived somewhere with a decent bookstore. Or ANY bookstore, for that matter. Cheers to you!